Disclaimer: Thanks to Aftershokz, United Relay of America and SweatPink/Fit Approach, I was comped an entry to run this stage. My opinions are my own. The United Relay of America was my first night mega relay race! I was a little anxious about making the pace minimum of 11:00min/mile, but it all worked out in the end. 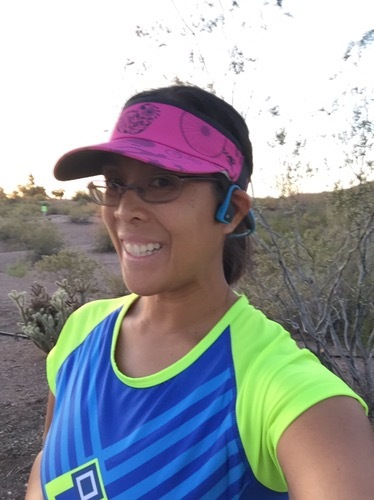 I wore a pink visor to represent Sweat Pink, and I love that the Aftershokz Trekz Titanium headphones matched my Moxie Cycling jersey! I had to make sure that I was visible, since we were running in the dark. I also sported my Nathan hydration vest and filled it with Tailwind (Naked flavored). Shout out to the awesome dude at the Pei Wei in Tempe for the ice! It really made a difference on this toasty night run! Susana (Ultra Adventures in Running), Laurel (Running to Happiness) and I were set to run Stage 52 of the United Relay of America. It was an interesting segment since it started at Papago Park and ended near the border of Tempe/Chandler. We had plenty of time for selfies before the Stage 51 runners Emily (Races and Places with azsungoddess and Chris) arrived with the baton! Then it was our turn to get this show on the road! We really didn’t know what to expect, we had a loose route planned but we changed it due to the street lights along the original route. We still ran into a ton of lights, but at least they were fewer amount! We were kinda expecting the blue team leaders to check in on us, but we figured they were resting for the evening. 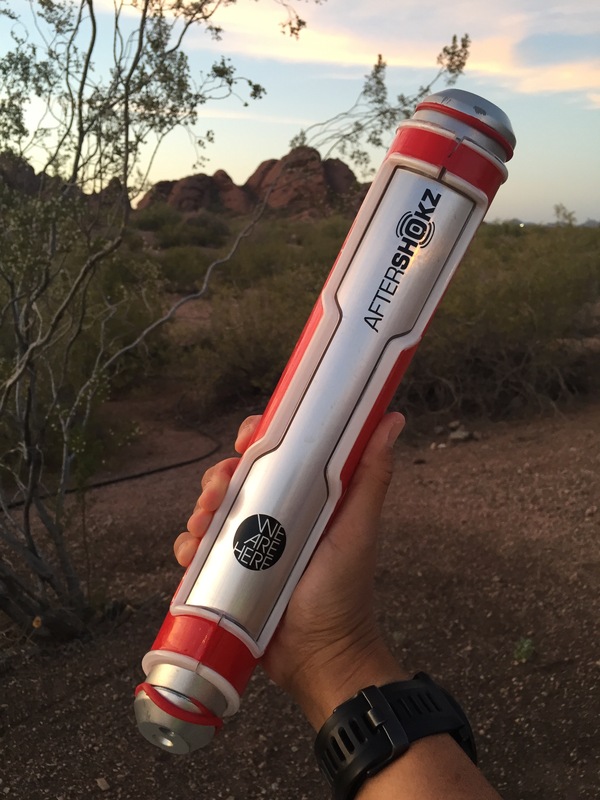 We left Papago Park and headed south into Tempe. We decided to run intervals at 2 min run: 1 min walk, and that got us a pretty good pace. As we were getting into our groove, the sun was setting, so it was really pretty along the lake. We ran a little bit through Mill avenue and the Arizona State University Campus. We made it through campus and through some residential areas, and we were so happy to pass the baton off to Stage 53 runners Katherine and Kristin. I had a great time running with Laurel and Susana through the streets of Tempe. 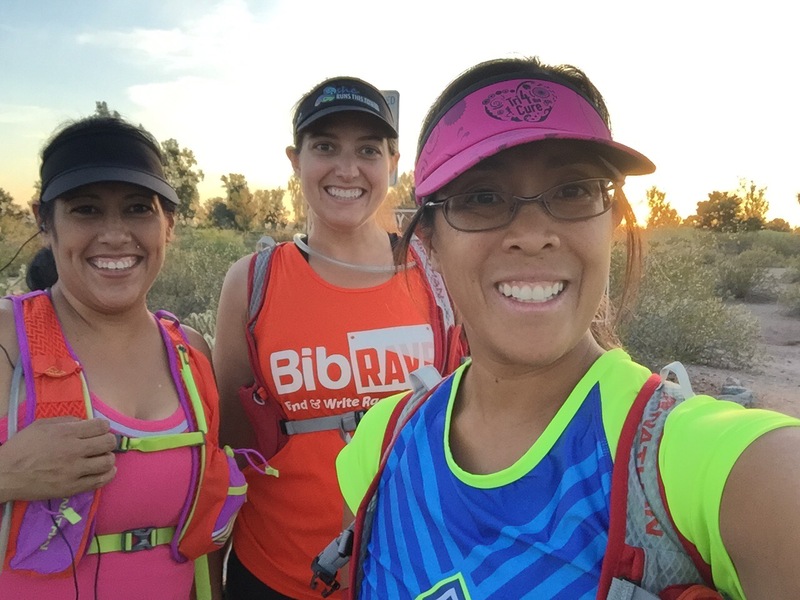 These gals are gearing up for their upcoming Ultra trail races and they are going to rock them! I’m so glad that I was able to hang out with them for a night time adventure run! Posted in Ambassador, Review, Sweat Pink/Fit ApproachTagged sweatpink, UnitedRelayBookmark the permalink.